The taproom of the newly-opened Millwood Brewing was part of a $1 million dollar renovation project. 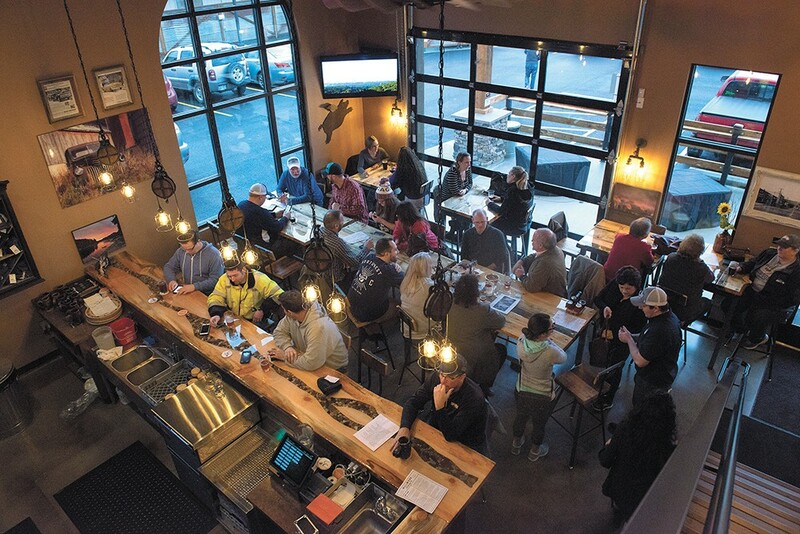 The brewing scene in Spokane and the surrounding region still shows no signs of slowing. Options for local craft beer drinkers continue to grow, with more than 40 breweries to date throughout the Inland Northwest. While doors of a couple of breweries closed near the end of 2017, many others remain successful, or are trying to find innovative ways to keep up with the trends, with more than a handful of breweries expected to open later this year. The latest brewery to debut in the region is Millwood Brewing Company. Chuck and Shelley Watkins purchased the property for the brewery off of North Argonne Road, at 9013 E. Frederick, three years ago. Chuck, an area manager for the technology company Cisco, and Shelley, former espresso stand owner and West Valley native, had dreamed of opening a brewery, and saw a demand for craft beer from the Millwood community. After about $1 million in renovations, the taproom is finally open to the public. The couple recruited Jordan Conley, a homebrewer and welder, as head brewer for their 10-barrel system. Conley is brewing a variety of traditional beers with the help of two assistant brewers. At opening, Millwood Brewing tapped a pale ale, IPA, Irish red and porter. They recently added a blonde ale and a Scotch ale served on nitro. Set up for 12 taps, the kid-friendly taproom will also feature house-made root beer, cream soda and cold brew coffee. Shelley says they also plan to host a local food truck every week in their parking lot, starting with Mac Daddy's on Thursday, Feb. 8. Openings of several more new breweries in the region are right around the corner. Dave Basaraba and Tim Hilton of Mountain Lakes Brewing Company have begun brewing their first batches and are planning for a March 14 grand opening. The small-batch brewery is located downtown, at 201 W. Riverside, next door to the Lion's Lair bar. In Liberty Lake, Erin and Richard Whitney are in the permitting process for their operation called Snow Eater Brewing Company. While an opening date is uncertain at this point, they're looking at some time in early summer. Across the border, Idaho's Priest Lake Brewing is planning to be operational by this summer. Kent Feldman's five-barrel brewery won't have a typical taproom, but will focus on supplying Priest Lake restaurants and pubs with local beer. Within the first week of 2018, two local breweries announced changes in ownership. After four years, Jeff and Anita Bendio sold English Setter Brewing Company, based in Spokane Valley, to local couple Reece and Jackie Carlson. The Carlsons have been brewing for a couple of years, and had started to consider opening their own brewery. However, after Jeff Bendio approached the two about potentially selling English Setter, things started to move more quickly than they originally imagined. "It couldn't have happened in a more perfect way," Jackie Carlson says. "Jeff and Anita are great mentors." She says they plan to keep brewing English Setter's staple beers, but they also want to slowly integrate their own recipes, like the recently tapped The Yard Scotch Ale. The couple are preparing for the brewery's fourth anniversary party on Saturday, Feb. 10, during which they'll be releasing two new beers: The Grimm, an imperial chocolate oatmeal stout, and Guard Dog, a Northwest-style IPA. In Post Falls, Downdraft Brewing Co. closed its doors in November after three years in business. Early in January, it reopened under new ownership of Ginger and Josh Cantamessa, longtime regulars of the brewery. The couple decided to make an offer to buy and keep the brewery going. Ginger Cantamessa started homebrewing 10 years ago, and while she hadn't brewed for the past five years, she says it wasn't hard to pick back up. Last week, Downdraft tapped its first new beer, a 6.5 percent ABV American stout. The couple plan to keep the current recipes, as well as cycle in their own creations. They are planning for a Feb. 24 grand re-opening. A prominent Spokane brewery also closed its taproom doors at the end of 2017. River City Brewing may no longer have its own space for locals to enjoy its beers seven days a week, but distribution of its lineup will continue throughout the region. The brewery is now putting full attention on the production side. Its team plans to phase out the current core lineup, as well as revamp its beer recipes. The VB Stout is to be replaced by Oako Coco, a low ABV (5.5 percent) stout brewed with French oak chips and cocoa nibs to give it an intense flavor profile. The Afternoon IPA will also be replaced by a rotating series of pale ales. With a quarterly release schedule, the Experience Pale will be an experiment in the various styles of pale ales. The first release boasts Simcoe and Amarillo hops. "We saw a shift in how people are experiencing beer," River City head brewer Todd Grove says. "I feel hopeful and positive about us making changes." The brewery will open its doors monthly for First Friday garage parties featuring live music, art and beer releases. Grove says the monthly event is a great way for River City to continue interacting with customers. Bellwether is celebrating the patron saints of brewing with special beer releases throughout the year. This Thursday, Feb. 8, the brewery is releasing St. Brigid, an ancient Celtic beer, and St. Comlumbanus, a traditonal altbier. Check out the brewery's Facebook page for future event details. English Setter Brewing, 15310 E. Marietta Ave.
After a change in ownership earlier this year, English Setter is ready to celebrate four years of craft beer brewing. Along with the releases of a new imperial oatmeal stout and Northwest-style IPA, there will be a raffle for a year-long mug club membership. Head to the Iron Goat taproom for a chance to paint a small growler. For $30, participants get a flight of six 4-oz. pours of their choice, along with hors d'oeuvres, a 32 oz. glass grunt, painting supplies and a coupon for a free grunt fill. Reserve your tickets by contacting Iron Goat. The original print version of this article was headlined "Something's Always Brewing"